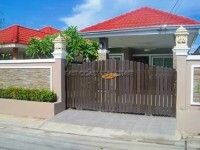 This private house located in Huay Yai, only 20 minutes from Pattaya City. Huay Yai is on the east side of Sukhumviht Road. The house has easy access to 7-11, Sukhumvit road, 331 highway and the local 'Chak-gniaw' market. This 44 wah² house comes unfurnished, fully air-conditioned in the 3 bedrooms, 3 bathrooms, private parking, private garden, storage room and a water tank. The property is in Thai ownership. The tax and transfer will be split 50/50 between the buyer and the seller. For viewing please call: 038730352 or email us now!